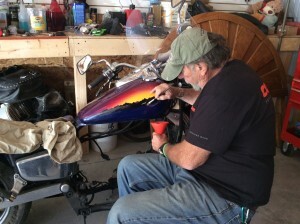 How the Custom Motorcycle Painting Process Works We work closely with our customers to bring their ideas to life. 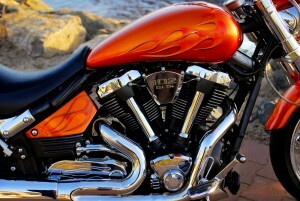 Most motorcycle and trike owners have an idea of what they want for their ride. We find the colors and the designs that will work together with your ideas to create the best custom paint job for your ride. The paint colors and designs are worked out through personal interviews. Then we usually do drawings of the artwork and then email back and forth with you, fine tuning the design until you approve it. We’ll even provide you with actual paint samples of the colors available, so you can choose the paint colors in person, or we can mail them to you. Once everything is approved, we begin the actual custom motorcycle paint job. Contact our motorcycle paint shop today at 410-937-3766 to get the ball rolling.